Noise-cancelling headphones, like Sony’s excellent WH-1000XM3, do an impressive job of silencing the world around you—assuming you’re actually able to wear them. Wearing headphones to bed to silence a snorer next to you isn’t practical or comfortable. So researchers at Northern Illinois University are integrating similar technology into a pillow that’s custom-designed to reduce the disruptive sounds of snores. Smart pillows aren’t a new idea: If technology can be crammed into a random object, you can be assured someone has already thought of doing it. But while the current offerings, like Rem-fit’s Zeeq, can detect nearby snoring and attempt to drown it out by pumping white noise through built-in speakers, a smart pillow that simply adds to the disruptive din in your room is far from an ideal solution. This time, as detailed in a paper published in the IEEE/CAA Journal of Automatica Sinica, researchers at Northern Illinois University did something different. They created a speaker-packed pillow that uses adaptive algorithms to help minimise snoring sounds in the same way a pair of noise-cancelling headphones can help silence the random sounds of a crowded bus, but adjusted on the fly for a specific frequency and sound pattern. 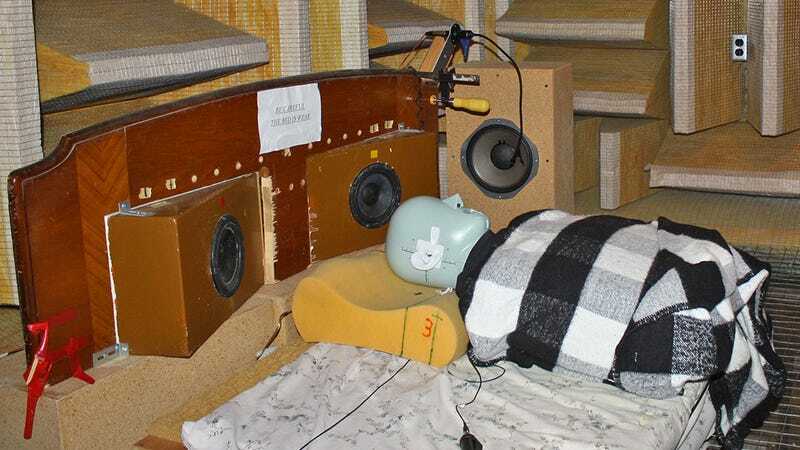 One nearby microphone captures the sounds of someone snoring, while two others capture the ambient sounds in a room, which are then all processed by an adaptive algorithm. No two snorers sound the same, and throughout the night, breathing patterns and the varying position of a sleeper can drastically change the sounds of their snoring or wheezing. Quick snorts might eventually stretch out into the sounds of a chainsaw working its way through the trunk of a towering Redwood. Using an algorithm that’s able to adjust and adapt its noise-cancelling capabilities for snores that get longer and shorter can offer improved performance over a catch-all filter that’s instead designed to silence any and all incoming frequencies. In their testing, the researchers found the pillow was able able to reduce the loudness of snoring sounds by up to 31 decibels. That’s enough of a drop to make a roaring vacuum cleaner instead sound like the murmur of a quiet office space. It’s a notable improvement, given the person making all that racket is lying right next to you in a quiet room, but will they ever be completely silenced?